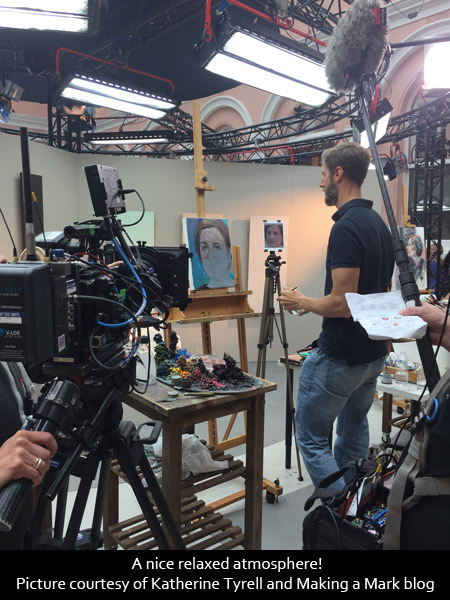 In April 2017 I was selected to appear on Sky Arts Portrait Artist of the year 2018. It was an amazing experience and here are my thoughts on the day. 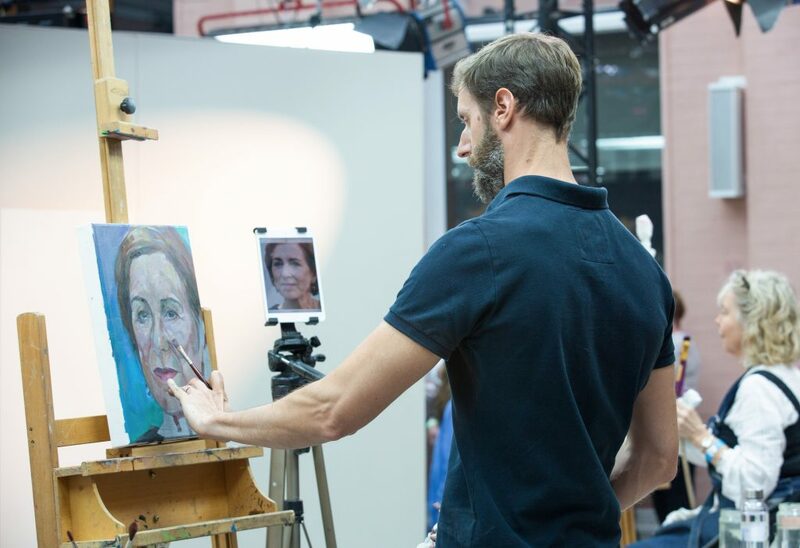 For those who don’t know, the tv show gathers together the best professional and amateur portrait painters in the country, in groups of 9, to compete to win Portrait Artist of the year. There are three judges, Kathleen Soriano, Kate Bryan and Tai-Shan Schierenberg of whom I’m a massive fan. 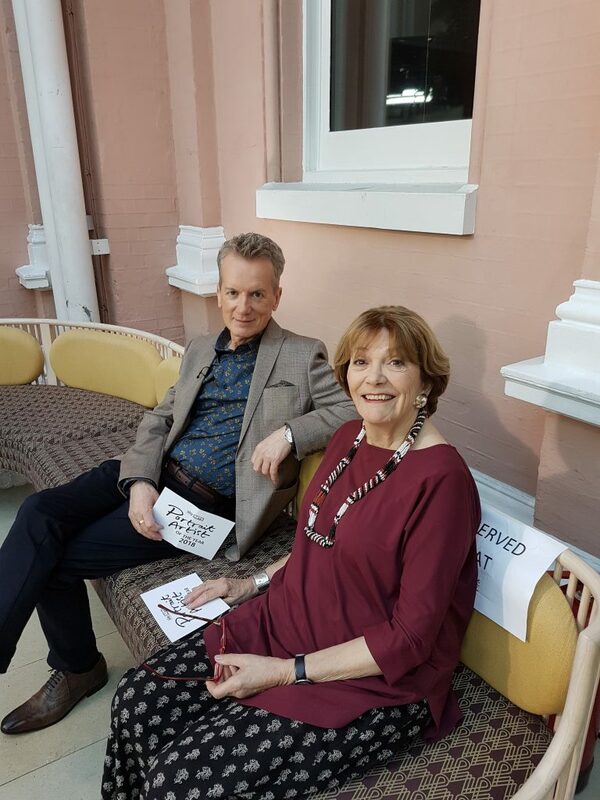 Joan Bakewell and Frank Skinner host the show. 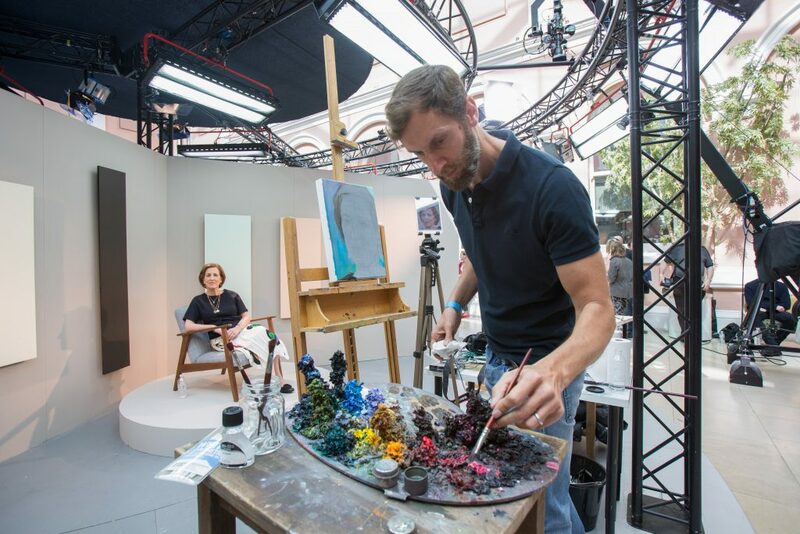 The format of the show is that 9 artists are split in to three groups of three and asked to paint three different celebrity sitters from life in 4 hours. On my show the sitters were Sir Derek Jacobi, Meera Syal and Kirsty Wark. 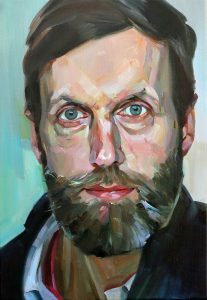 To get selected artists have to submit a self portrait that demonstrates your style and ability and that hopefully suggests you can capture and communicate more than just an accurate physical likeness. For my selfie submission I decided to paint it in just 4 hours, the format of the show, so it would hopefully demonstrate what I might be capable of producing on the day. In hindsight the problem with this approach is that it didn’t show off what I can produce under ‘normal’ conditions over a longer time frame. It is really just an oil sketch. I would typically take weeks to finish a portrait commission. I decided to depict myself with a fairly intense direct gaze, to try and grab the judges attention! I like to not over mix my colours, that way you get lovely bright fresh marks that can give skin in particular a real luminosity, with tiny nicks of pure colour showing through. I like each mark to create interest and earn its place on the canvas. Not over mixing colours also stops colours getting too dull or muddy. Colour is definitely my thing! I try and use it to help describe my sitters personalities too. Muted desaturated colours could suggest a more private, reserved and maybe even introspective personality. Bright colours could suggest confidence and a more out going, extroverted character. They get an amazing range of fabulous sitters, from well know actors to musicians and people in the public eye. 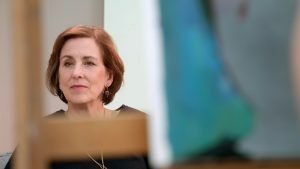 I was lucky enough to get Kirsty Wark as my sitter. I knew Kirsty as a journalist and television presenter on Newsnight and from her other work as an author, in newspapers and on tv over the years. She is clearly a very bright, passionate communicator and inquisitor. 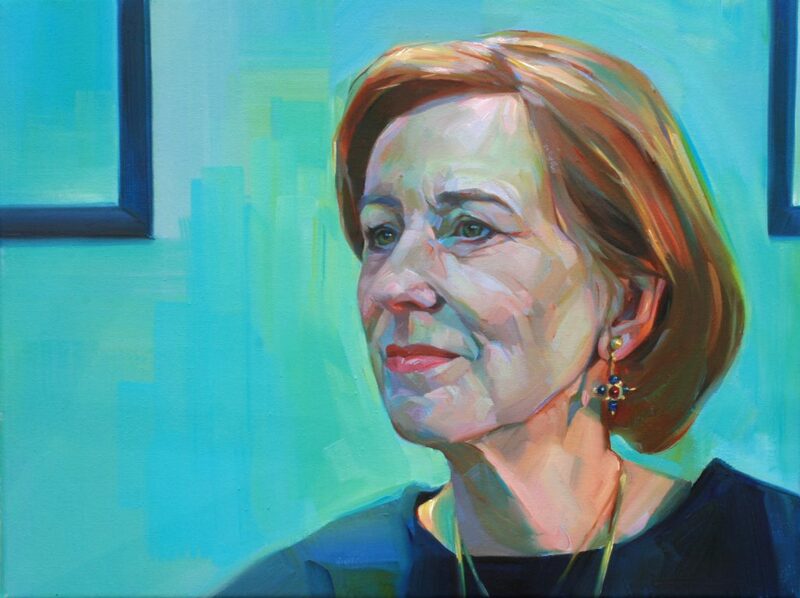 I was also aware that she is a very knowledgeable patron of the arts and was a recent judge on the BP Portrait award. My question was to ask Kirsty to tell me who she is as a person when not in the public eye, to see if I could then communicate some of this in my portrait. Kirsty said that in her role as Newsnight anchor she needs to take politicians to task and report on serious events, therefore doesn’t always get the chance to show her off her sense of humour and perhaps her warmer side. I thought I should use bright colours for her personality, a close cropped head to draw in the viewer and an alert, warm glint in her eyes. 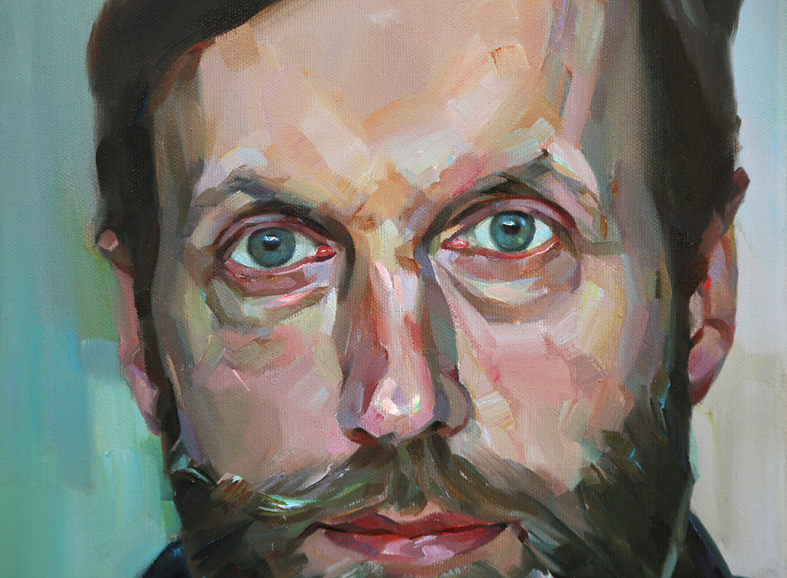 As a portrait painter, a typical day for me is walking to the bottom of my garden and working alone in my studio. It allows me to really immerse myself in the creative process without any distractions, well at least until my kids get home from school. 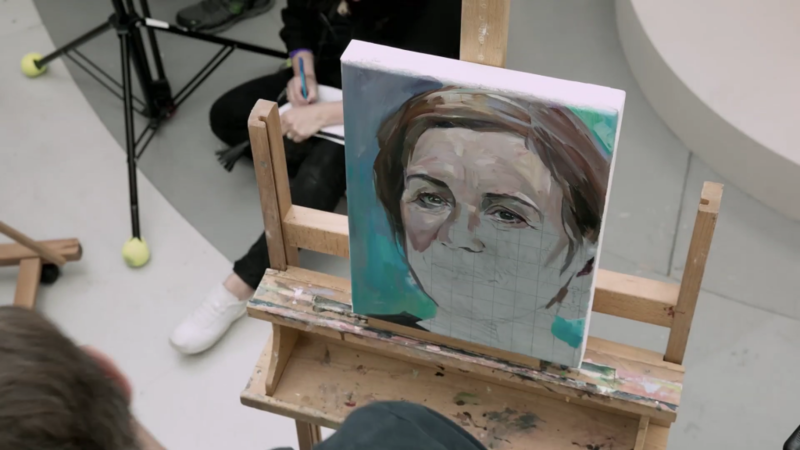 Portrait Artist of the year is located at The Wallace collection in London, an amazing collection of works including paintings by Rembrandt, Frans Hals and Canaletto. To paint in that space was a real privilege. The challenges to overcome on the day were the 4 hour time limit, in reality 3 hours of actual painting time as interviews and other bits of ‘telly stuff’ eat into the 4 hours. Painting a sitter you had only just met was another test. I like to get to know my sitters a bit if possible, to better inform who I’m attempting to describe. The lighting. The Wallace Collection has a glass roof so the light can change hugely through the day. We got lucky with the weather on the day as some episodes I’ve seen have had direct sun in the artists eyes! As a result of this possibility and the fact the sitter is shared between three artists and might also quite reasonably want to move, I opted to take a photo of Kirsty as a constant reference of lighting and expression. I used this to base the drawing on. To get an accurate drawing I decided to grid up the reference on an ipad, however made a ludicrous mistake in downloading a gridding app the night before. As I zoomed in on the picture the grid lines disappeared! This meant my composition couldn’t change from a slightly odd crop. My fault for using untried technology. At least now it meant I would just observe Kirsty and focus on the painting. Painting in public was probably the biggest challenge. 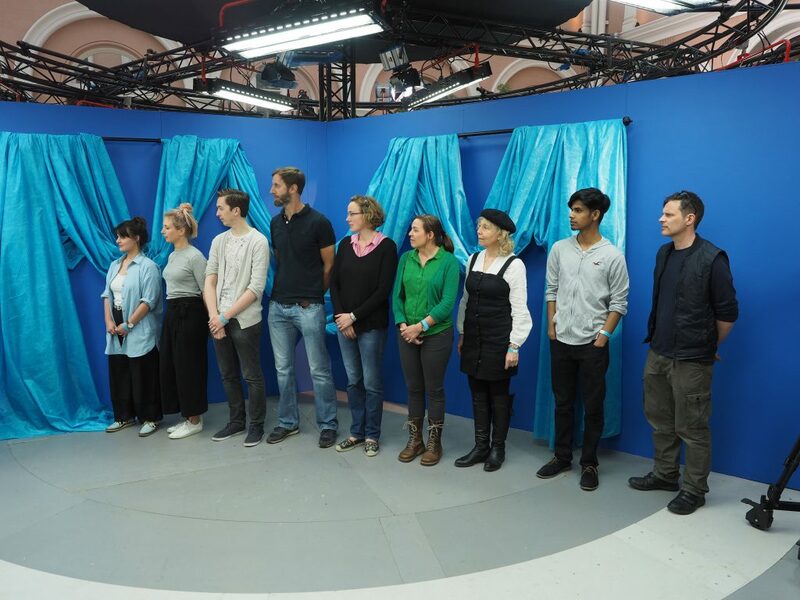 Having fans of the show as well as camera/sound people and the judges watching you paint was a tricky thing to block out or try to absorb! I used to scrape the paint off my palette after each session like ‘normal’ artists, then after accidentally leaving it to dry on while away on holiday once, I decided to just keep adding to the piles. Over the years the dried paint has grown and grown, forming a bizarre alien landscape. So now I add a squidge of fresh paint to the coloured towers before each session. My working area is getting smaller but the paint gets closer to me each time, handy when you’re 6 foot 7. In hindsight I spent far too long gridding and drawing up the composition, enjoying taking in the surroundings and chatting to Kirsty and the lovely judges! Although why wouldn’t you, I don’t get out much! There was a point where I realised I was horribly behind and so I made a decision to not panic and start rushing, but to just focus on the eyes and then see what else I could complete before they called time. I threw in the bottom half of poor Kirsty’s face in the last 5 minutes, which meant flat colour and no chance of modelling the chin or the mouth. When judges start asking you if you’re ‘concerned about the time’, you know you must be running a touch late. The show asks each sitter to choose a portrait to take home and I was delighted when Kirsty chose mine. I was also thrilled the judges shortlisted me for the final 3 contestants. I was honoured to be alongside the fabulously talented Frances Bell and Jonathan Luxon, who won on the day and totally deservedly so. 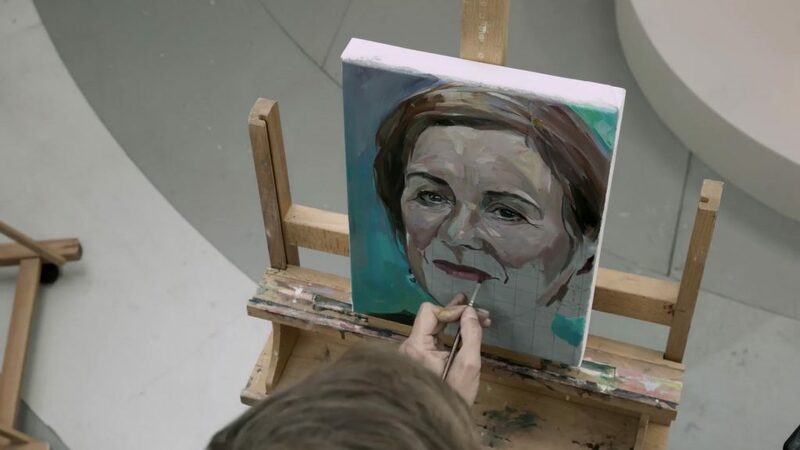 I thought Frances’s portrait of Sir Derek Jacobi was a truly beautiful piece of painting and Jonathan really caught Meera to tee. I have subsequently produced a more finished painting using my references from the day and over a slightly longer time frame. Kirsty mentioned she felt like Whistler’s Mother sitting on set, so I thought it would be fun to reference that with two cropped picture frames. The background has blocks of colour that hint (very subtly!) of tartan and her Scottish heritage. The day was exciting and absolutely exhausting, but one I would recommend to any artist who fancies a truly unique challenge. The other artists I met were completely lovely and I feel we really bonded over the shared experience. We have all stayed in touch and it’s been fun to discuss the show and wince together as it was finally aired! The people who work on the show couldn’t have been nicer or more helpful and were really keen to show you in your best light. It would have been great to get a few more hours to work on the portraits, or even to take them home to work on for a week or two, but that isn’t the format of the show! It was an amazing, surreal at times, experience that took me out of my comfort zone. 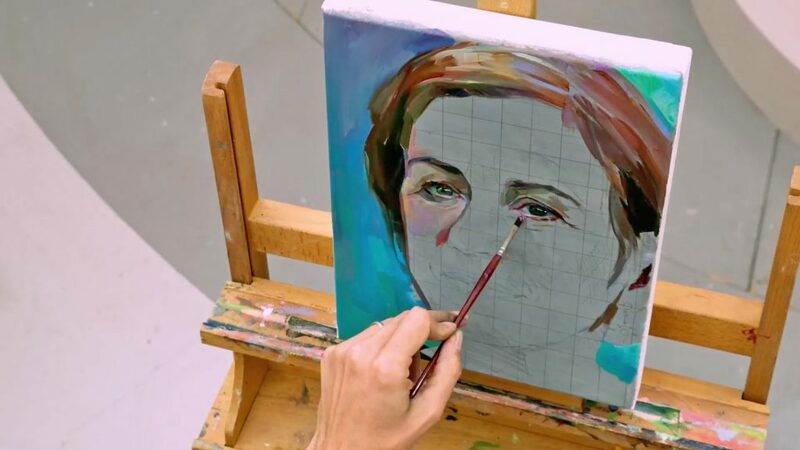 I think you have to challenge yourself to try and develop as a portrait painter and I feel I learnt a great deal from the day, not least to speed up, paint efficiently and make each mark count.